The BQ2092 Gas Gauge IC With SMBus-Like Interface is intended for battery-pack or in-system installation to maintain an accurate record of available battery charge. The BQ2092 directly supports capacity monitoring for NiCd, NiMH, and Li-Ion battery chemistries. The BQ2092 uses the SMBus protocol that supports many of the Smart Battery Data (SBData) commands. The BQ2092 also supports SBData charge control. Battery state-of-charge, capacity remaining, remaining time and chemistry are available over the serial link. Battery-charge state CAN be directly indicated using a four-segment LED Display to graphically depict battery full-to-empty in 25% increments. The BQ2092 estimates battery self-discharge based on an internal Timer and Temperature Sensor and user-programmable rate information stored in external EEPROM The BQ2092 also automatically recalibrates or learns battery capacity in the full course of a discharge cycle from full to empty. The BQ2092 may operate directly from three nickel chemistry cells. With the REF output and an external Transistor a simple, inexpensive Regulator CAN be built to provide VCC for other battery cell configurations. An external EEPROM is used to program initial values into the BQ2092 and is necessary for proper operation. 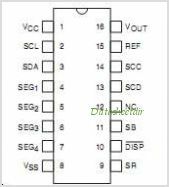 This is one package pinout of BQ2092,If you need more pinouts please download BQ2092's pdf datasheet. 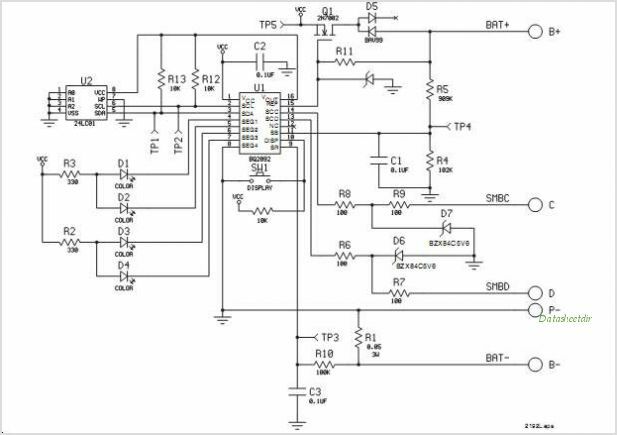 This is one application circuit of BQ2092,If you need more circuits,please download BQ2092's pdf datasheet.